There’s some curiosity surrounding exactly how Kevin and I are taking this 3 month long trip. Sure there’s a lengthy list of travel bloggers, photographers, and influencers out there who have worked long and hard to achieve a life of full-time travelling, but for us normal folk (shall I call us peasants? JK) who work the Monday to Friday 9 to 5 jobs to get to that 2 week vacation once a year - how can you too, plan and prepare for an extended trip? Just kidding, there’s a bunch of other things you need to know too. But in all honesty, those first two points are the most important. Because everything else will get sorted out. You just need to want it bad enough to do whatever you can to get there. You need to want it bad enough to give up your daily Starbs. And those new Lulus you’ve been eyeing. And those unnecessary extras at Sephora. And maybe even Taco Tuesdays on the reg. There’s a super powerful motivational video by Eric Thomas and he says “You need to want it as much as you want to breathe”. And I’m not going to be that dramatic and say that’s how you need to feel, but you need to at least want it bad enough to work for it. Check out the full Eric Thomas video here. Anyway, since we’ve been asked a bunch of questions, I’m gonna squash them all in one go alongside giving you some tips on how you too, can plan for a long haul trip. Yes and no. Kevin asked for a leave of absence but since his employer can’t hold his position for him (understandably), he resigned and will be re-applying when we return. And if you plan on doing that too, don’t be burning any bridges - it’s obviously important to leave on good terms (duh)! I on the other hand, am reducing my hours significantly and will be working a few hours per week remotely while we’re gone. But whatever your situation might be, there’s always a solution for getting what you want. If you’ve got a job you love (or don’t love - but that’s just more reason to quit), that doesn’t mean you can’t make an extended trip work. Although quitting is the initial obvious solution, a leave of absence would ensure you’re returning home to employment. But if you’re not granted a leave of absence, then perhaps look into working remotely. And if your job isn’t something that can be done remotely, then check to see if your workplace has a vacation program in place. Some employers have a vacation program that you can choose to opt into, like taking a reduced annual salary in exchange for a 6 week paid vacation for instance (this is a real thing). Rocky’s going on a 3 month vacation too! At Nona and Opa’s - Rocky’s fave humans of all time. When you’re planning to be away from home for an extended time, make sure all your payments and bills are taken care of. Do you have a cell phone bill? Water? Electricity? You can automate all these payments, typically by going online and changing your payment settings. At least this way, you can set them and forget them. Memberships are another thing you’ll need to check off your to do list. For the gym or for Netflix, whatever your memberships are, they’ll need to be taken care of too - whether you cancel them, pause them, or transfer them. We gave our notice of lease termination back in September and will be saying sayonara to our beautiful condo a few days before Christmas. And when Boxing Day rolls around, we’ll be saying sayonara to Canada too! Georgia the Jetta is also going on vacation and will be staying with Papa Lim while we’re gone. He'll be taking her out for a ride once in awhile to make sure her tires don’t get out of shape. But if your car is sitting still for some time, they say you should prop your car up on cinder blocks to make sure your tires don’t get flat on one side. Speaking of which, you’ll also need somewhere to store your car if you don’t have a garage or driveway readily available. With our cold AF winters here in Canada, you’ll also need to make sure your gas lines don’t freeze, so fill your gas aaaall the way up and add in some gas stabilizer. I’m by no means a mechanic (far from it) so you’re gonna have to Google this one. Or better yet, chat with a car guy. Since Kev’s a car guy, I can wash my hands of this one. Vodka or Tequila? More like Hep A and Typhoid! If you’re going somewhere super foreign, chances are you’ll need shots. And you’ll most likely need to get them at least a month or so in advance, so worth looking into long before you leave. Details on this can be found here: How to Plan a Trip. Travel, health, baggage and cancellation. Read about it here: How to Plan a Trip. My dad would never admit to being worried about us travelling so far away for so long, but his actions speak louder than his words. He likes to send me articles about travellers who got sick and died overseas and keeps me up-to-date on the latest news stories about people who got kidnapped or murdered during their travels. Like maybe if he sends me enough scary stories that I’ll back out of my trip? Regardless, I know he’s worried and so are Kev’s parents. So at the very least, we’ll be sure to send a weekly email or text to our fams and reassure them that we’re still safe and sound. If the people you need to get in touch with while you’re away aren’t iPhone users, then another great tool to use for communication overseas is Whatsapp. I think by now, most people know what it is, but it’s basically a downloadable app available on both Android and Apple phones that mimic Apple’s iMessage - messaging that doesn’t require cell service to operate. It works off data and wifi, and since most people pop out their SIM cards when they’re away, this still works when you don’t have a chip in. We’ve put together a package of documents that includes our flight information, our accommodation reservations, and most importantly, a copy of our passports and we’re leaving a copy with each of our parents. 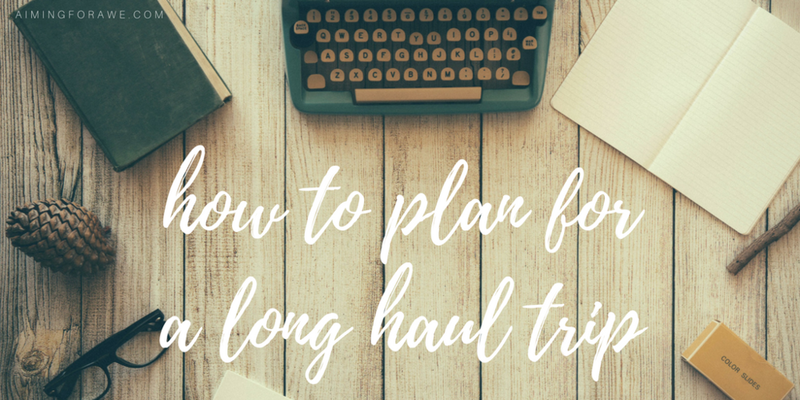 To my well-travelled babes out there, I’d love to hear how you plan for your long haul trips! If you have any advice to add, leave it in the comments below. I’d love to hear from you!